Identify the effect of product architecture, capabilities, and constraints on a conceptual design. I may be looking at this the wrong way but I think this is actually around how specific products architecture, capabilities and constraints isn’t applicable in a conceptual design as for a conceptual design you are only creating a “napkin” design diagram of how the whole environment is going to be delivered. Relate business and technical requirements to a conceptual design. As mentioned these requirements will be gleamed from the Design Workshops/Stakeholder meetings and then put into the conceptual design. This is where you would work out if the customer requires a private, hybrid, public or even community cloud deployment. For example if the customer requires certain data to remain in a country for regulatory reasons then in the conceptual design you know compute resources, networking and connectivity between that country and the primary site need to be available. The speeds, number of hosts, make of hosts and amount of memory and vCPU are not in the conceptual design as this is the “napkin” design just covering the concept of how it will all work out and may actually change once you get to the logical and physical designs. To make sure you are doing the design in a VCDX-like manner which should push you to do it at a very high level, don’t forget to refine the customer-specific technical requirements and validate that they are specific, measurable, accurate, realistic, and testable (SMART). Also knowing what the customer already has can help you understand possible future constraints for example that all their current servers are IBM and so this is likely to be the server platform for this design. There may also be a requirement to use existing legacy physical kit already present in the datacentre which needs to be recorded and fully understood so that the risks and constraints of using this infrastructure are fully understood. For example if you are using legacy network switches which can’t do stretched VLANs this will impact your design substantially if you have two sites and a requirement for the Management cluster to be failed over/migrated in the event of a disaster. This is plainly what is the customer looking to gain from the deployment of this solution? At the end of the project what do they hope to achieve? These are sometimes not as clear as you may hope as people have different ideas of what they want the solution to achieve so as the architect you will need to take all these business requirements, set expectations if they are unrealistic due to varying reasons like cost or pre-selected hardware and then define them and get sign off from the customer that they agree to these before any additional work is done. This is very important as if these aren’t defined and agreed to by the customer then scope creep can happen which could cause the project to fail. Identify requirements, constraints, risks, and assumptions. I’m not going to go into great depth here as I think the definitions of each will give you a good idea of what each is. During the design workshops/stakeholder meetings these are worked out, recorded and agreed to by the customer. Always remember that for any design you need to collect all of these and then look at it in a holistic manner and understand the impacts of each decision. Requirements – Documented statement that depicts the requisite attributes, characteristics, or qualities of the system. See above portions around Business and Technical requirements plus the examples. For assumptions and risks I like to get these highlighted to the customer right away as you normally don’t want any assumptions if possible and for the assumptions you record in your design you want these to be realistically clarified already so that the assumptions are only there to ensure that if what they promised would be there isn’t you can refer them to the assumptions they signed off. Given customer requirements and product capabilities, determine the impact to a conceptual design. This I think is covered above in places but is also something you can only really learn from actually doing a design and understanding how requirements shape a design and what impacts each of them have. On a conceptual design it isn’t as much of an impact as in a logical and physical design but limitations like keeping workloads in specific geographies and the capability of vCloud stretched clusters between the two locations for example are something that will impact the conceptual design. I would also read the Service definitions listed below in the recommended tools from the blueprint and the implementation examples from the vCAT. Categories: Certifications, VCAP, VCDX, Virtualisation | Tags: Certifications, design, ESXi, VCAP, VCAP-CID, VCAP5, VCAP5 Blueprint, VCDX, VCDX5, vCloud Director, Virtualisation, virtualization, VMware | Permalink. This Monday I re-sat my VCAP5-DCD exam after having marginally failed it the first time in January this year. I wrote a fairly extensive blog posting about my opinions about the exam and the additional resources I planned to use. I would recommend people read that posting first if you haven’t as I still maintain 95% of the pieces I said and mentioned in there are true about the exam. This time I thankfully passed the exam and with not a bad score of 333 also. – I read the official VMware book Building a Virtual Datacenter to try help me get the holistic view and mentality you have to maintain during the build of a virtual datacenter and how every decision can have an impact on another portion of your environment and design. The book was really good and I would recommend it but I have to admit I did skip certain portions as I had covered them in books that had them covered much better and in more depth. -I bought the kindle version of the new VMware vSphere Design book from Forbes Guthrie and Scott Lowe. I bought the kindle version as the paperback version wasn’t out in Europe for a while and my timeframes for studying were very tight. The book is utterly brilliant and covers both vSphere 5 and 5.1 and I would HIGHLY recommend it for the exam and anyone who works with VMware. -As I stated I would, I read the VMware press book Managing and Optimizing VMware vSphere Deployments by Harley Stagner and Sean Crookston which helped me gain more knowledge around all the portions of a design and the link each component in the design has. The main piece from this book that i really liked was the operational portions as you can’t do a design without having the end goal and plan of it being able to run for a long time after you have left (if you are a consultant like I am). I was more nervous for this attempt than my first attempt as I really wanted to pass it this time as with having a five week old little one my studying schedule took a knock and I actually postponed the exam for two week later from it’s initial date due to not getting through portions I wanted before the attempt. Once I got into the exam and started making my way through the questions with each question I felt I had got correct or very close to correct i became more and more confident. I also think i managed my time a bit better this time and wasn’t as overwhelmed by what they were asking of me. Before the exam starts they tell you how many visio style questions you are going to get so I wrote down the numbers (1-6 for me) and marked them out after each one so that I knew how my time management was going. I did have two drag and drop questions in my last three questions which used up my time and meant i only had around 8 minutes left by the time I completed the last question. The result came up and very quickly and I was in shock that it stated congratulations and actually started feeling dizzy after not having been able to eat much before the exam due to feeling sick from nerves and not having drank much as I knew I couldn’t afford toilet breaks. For this attempt i came across and learnt a few tips for the exam which helped me with the visio style questions and allowed me to be sure portions were connected correctly. -There is a scissors icon beside the bin in the right hand bottom corner that allows you to cut a connector/connection you have made in error without moving loads of portions across the page by trying to move the connection to the bin. I did this drag and drop mistake a few times in my first attempt and it really hurt me as it moved portions off the screen and so meant I had to redo pieces. -Make sure connections have stuck to boxes by carefully trying to move the box and seeing if the connector follows. This is related to the piece above and is a good tip to make sure you have connected the boxes correctly. Also make sure you connect the correct portions together as I noticed once or twice I didn’t click the correct piece and so the pieces I meant to have connected were actually not connected so be careful where you click. -Do practice designs at home on paint or visio or even word to allow yourself to visualise how you would do different visio style designs scenarios so that when you are in the exam and maybe see one of them you know what your final designs should look like. So now that I have both my VCAP5-DCA and DCD I can start designing my VCDX infrastructure and submit the design for defence for the VCDX5 accreditation. I still need to do some soul searching and decide when I want to submit as it’s a serious amount of work to complete all the required documents and my planned design is only about 60% where I want it to be before submitting it so I’m estimating around 40 hours of work to get it all ready which isn’t easy to find with a 5 week old, a full time job as a consultant and my sanity maintained. I will most likely slowly start building my design and documents and submit for PEX early next year although I may be drawn to do it sooner or later. For those looking to do either of the exams I would recommend starting right away and also booking a date for it so that you are pushed to get through everything, the exams are very challenging but there are amazing resources out there which will help you gain the knowledge to pass the exam and with loads of lab time and practicing you can pass them. Good luck to all those who are preparing or looking to do the exams and hopefully my resources page and this blog help you. Categories: Certifications, VCAP, VCDX | Tags: Certifications, design, VCAP, VCAP5, VCDX, VCDX5, Virtualisation, virtualization, VMware | Permalink. In my previous posting I created a fictitious company who requires you as the VMware Architect to design them a vSphere 5.0 environment to meet all their requirements whilst keeping within their constraints and mitigating risks. 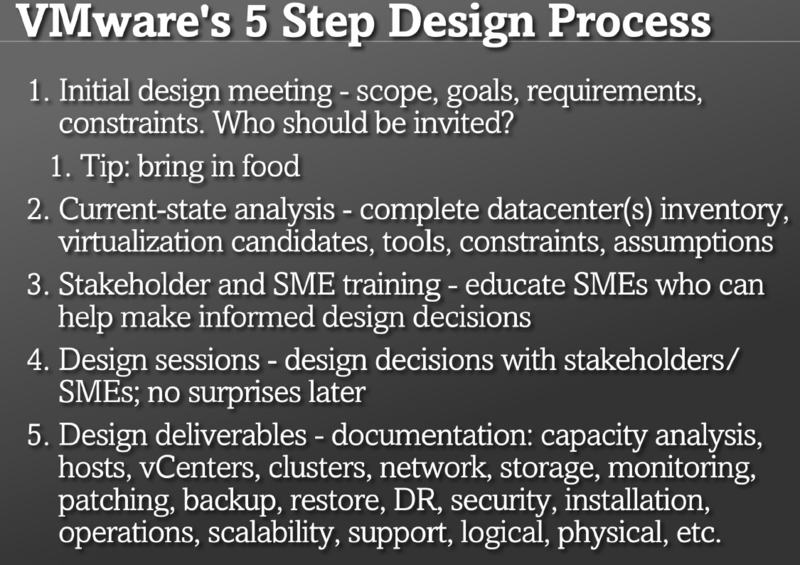 Now I didn’t list the constraints or the risks as I felt this was something that is very important to learn how to define in preparation for the VCAP5-DCD and vSphere designs in real life practice. The first portion of the design I’m hoping to create (and get everyone’s opinions,participation and comments on ) is the storage design. So below are the portions I will be trying to fill out for the Safe and Legit scenario and hopefully people also wanting to learn and participate will fill out each of the sections with their own design decisions and then we can compare and hopefully learn together/off each other. Categories: Certifications, VCAP, VCDX, Virtualisation | Tags: design, Safe and Legit, VCAP, VCAP-DCD, VCAP5, VCAP5-DCD, VCDX, vSphere Design | Permalink. The VDCA510 exam consists of approximately 26 live lab activities and a short pre-exam survey consisting of 9 questions. Live lab activities consist of multiple tasks, where each task is scored. The total number of activities provided is based on the total number of tasks. Because of this, the actual number of lab activities may vary slightly between exams. As I am under NDA and because I want to maintain the high level of the exam I’m not going to go into specifics but more my experience of the exam, what I used to prepare, how it compared to the VCAP4-DCA and what I would recommend to someone looking to attempt the exam. I did the VCAP4-DCA twice so I knew what to expect a lot more but my experience of this exam was fairly different. I arrived at the testing centre far too early (an hour and a half before my exam), my slot was at 11am but I wanted to miss traffic and forgot it is Half Term for UK schools so I had a very easy drive in. I waited in the testing centres cafeteria, ran through a number of commands, and advanced settings in my head that I wanted to remember just in case I was asked to do them in the exam. I was called through and did the usual security clearances, photo’s, signing sheets and removing my watch etc. as Pearson are very strict now on what you can take in (no drinks,watches,phones,food,sweets). I then got setup on my testing station, said a little prayer and began the test. The resources I used to prepare are listed on my VCAP5-DCA and DCD Study Resources Page already so I’m not going to go into too much detail there but I do have to give special thanks to Josh Coen, Jason Langer,David M Davis and all the US vBrownbag guys as all their resources were priceless in my studying for the exam and I would highly recommend watching the vSphere 4 VCAP resources David did around troubleshooting and Management especially as even though they are on vSphere 4 they are highly applicable and as ever of a very high level. What wasn’t and is not listed on that page which I did mention a bit about above that I needed in the exam was real world experience with the solution and the technology. 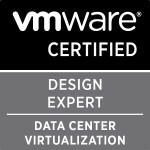 I am very fortunate that I work for an IT consultancy specialising in virtualisation and for the past year I have been designing and rolling out vSphere 5 at an enterprise level to customers, which meant I had to really learn what everything did to ensure what I recommended and built for the customer was the best. Now I know everyone can’t/hasn’t had that kind of experience but what I also did that I didn’t do enough of for my VCAP4 attempts was spend loads and loads of time in my home lab building, breaking and fixing every single piece mentioned in the exam blueprint. I worked out that For the last month whilst preparing for the VCAP5 I spent around 55-60 hours practicing in my lab which is a serious amount seeing as I was at VMworld Europe a few weeks back. I believe this piece is as important if not the most important part of preparing for the exam as this exam isn’t like the VCP or any other exam I’ve done before as it is 100% lab based and you are under extreme time pressure to get things completed and so you need to know how to do something like it is second nature and know how things are connected. Micro servers are really cheap, it is worth the investment in getting one or two, and some shared storage and spending the time practicing. The exam was very challenging but I hope I have done enough and the amount I have learnt by preparing for this exam is only going to help me do my job better and feel more comfortable doing my job now with the knowledge and skills I have learnt but preparing for the exam. If you are thinking of trying the exam then I would highly recommend it, it is a challenge but it’s one that isn’t impossible and it will push you to that next level. The resources out there for preparing are amazing and are extensive. Make sure you don’t cut any corners and practice, practice and practice some more as I was able to do a few things only due to me forcing myself to practice every single method of doing things. Also, let your partner know you are aiming for the exam, I know this is a drop in the ocean compared to the time you need for something like the VCDX but to fully prepare for the exam you will need to study in the evenings after work and for all of your weekends. Categories: Certifications, vBrownbag, VCAP, Virtualisation | Tags: VCAP-DCA, VCAP5, VCAP5 Blueprint, VCAP5-DCA, VMware | Permalink.